MOSCOW, Russia -- Russia said on Saturday it had no intention of invading eastern Ukraine following its annexation of Crimea, while the Black Sea peninsula's Muslim Tatars demanded autonomy. Russia's Grand Mufti Ravil Gainutdin (C) greets a delegate as they attend the Kurultai, the assembly of Crimea Tatars, in Bakhchisaray. US Secretary of State John Kerry and Russian Foreign Minister Sergei Lavrov will meet on Sunday in Paris, the State Department said, as both sides moved to ease tensions in the worst East-West stand-off since the Cold War. In a pivotal political development, Ukraine's presidential election effectively became a two-horse race when boxer-turned-politician Vitali Klitschko pulled out and threw his weight behind confectionary oligarch Petro Poroshenko. This sets up a May 25 contest between the man known as the "Chocolate King" and former prime minister Yulia Tymoshenko. Speaking on Russian television, Mr Lavrov reinforced a message from President Vladimir Putin that Russia would settle - at least for now - for control over Crimea despite massing thousands of troops near Ukraine's eastern border. "We have absolutely no intention of - or interest in - crossing Ukraine's borders," Mr Lavrov said. Mr Putin called US President Barack Obama on Friday to discuss a US diplomatic proposal, with the West alarmed at the threat to Ukraine's eastern flank from what US officials say may be more than 40,000 Russian troops. But Mr Lavrov said Russia is ready to protect the rights of Russian speakers, referring to what Moscow sees as threats to the lives of compatriots in eastern Ukraine since Moscow-backed Viktor Yanukovich was deposed as president in February. NATO Secretary-General Anders Fogh Rasmussen, in an interview with Germany's Focus magazine published on Saturday, said the alliance is "extremely worried". "We view it as a concrete threat to Ukraine and see the potential for further interventions," he said. "I fear that it is not yet enough for him [Putin]. I am worried that we are not dealing with rational thinking as much as with emotions, the yearning to rebuild Russia's old sphere of influence in its immediate neighbourhood." In the Tatars' historic capital of Bakhchisaray, the assembly representing the 300,000-strong indigenous Muslim minority voted in favour of seeking "ethnic and territorial autonomy" in Crimea. They make up less than 15 per cent of Crimea's population of 2 million and have been overwhelmingly opposed to Russia's annexation of the territory. "In the life of every nation there comes a time when it must make decisions that will determine its future. 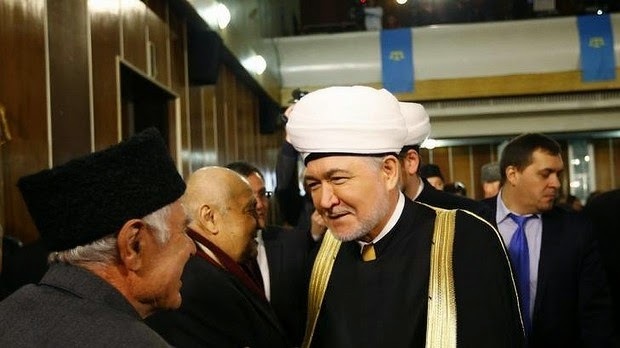 I ask you to approve ... the start of political and legal procedures aimed at creating ethnic and territorial autonomy of the Crimean Tatars of their historic territory of Crimea." The assembly backed his proposal. Critical of Russia's annexation of Crimea, the Tatars boycotted the March 16 vote to split from Ukraine and become part of Russia. Moscow has tried to pressure them to drop their opposition. However, their proposal to seek autonomy signals they would be ready to negotiate their status with Russia. The West imposed sanctions on Russia, including visa bans on some of Mr Putin's inner circle, after Moscow annexed Crimea this month following a referendum on union of the Russian-majority region with the Russian Federation that the West called illegal. Mr Lavrov called for "deep constitutional reform" in Ukraine, a sprawling country of 46 million people divided between those who see their future in closer ties with Europe and mainly Russian speakers in the east who look to former Soviet master Russia. "Frankly speaking, we don't see any other way for the steady development of the Ukrainian state apart from as a federation," he said. Each region would have jurisdiction over its economy, finances, culture, language, education and "external economic and cultural connections with neighbouring countries or regions," he said. "Given the proportion of native Russians [in Ukraine], we propose this and we are sure there is no other way." Mr Lavrov and Mr Kerry spoke by phone on Saturday, following up on the Putin-Obama call on Friday. The White House said Mr Obama told Mr Putin that Russia must pull back its troops and not move deeper into the former Soviet republic. The Kremlin said Mr Putin suggested "examining possible steps the global community can take to help stabilise the situation". Ukraine remains deeply divided over protests that led to Mr Yanukovich's overthrow. Many eastern Russian-speaking regions are sceptical about the policies of the new pro-Western government in Kiev. Mr Yanukovich called on Friday for each of the country's regions to hold a referendum on their status within Ukraine, instead of the presidential election planned for May 25. Mr Poroshenko was an influential supporter of the "Maidan" popular uprising that toppled Mr Yanukovich in February, three months after he spurned a deal on closer ties with the European Union and plunged the country into turmoil. Mr Poroshenko confirmed his candidacy late on Friday. Several opinions polls already had him in the lead even before he said he would run to succeed Mr Yanukovich. Timoshenko can not be trusted in any circumstances. All her rhetoric against Russia is nothing but a bluff. Not a long a go just in 2009 she had same tough rhetoric and then turned around and signed unprofitable gas deal for Ukraine that coast Ukraine billions of dollars. She will do it again and again, betraying Ukraine.